The gray-headed spin-masters of competitive communalisms of Hindu and Muslim varieties have been using respective community youth as the foot soldiers of their hate campaigns across the country for long. 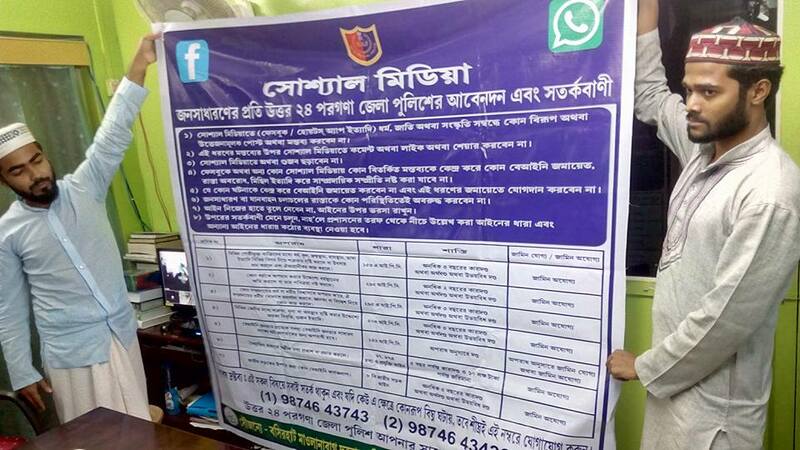 Baduria- Basirhat this time has highlighted the role of ‘facebook and whatsapp generation’; not only as the perpetrators of sectarian violence but also as most effective messengers and the force multipliers of inflamed passions. And, the digitally powered social media has almost become a message itself heralding the coming of age for the post-truth generation. No doubt, the boom of smartphone users with 24X7 affordable accesses to social media networks, both online and offline as well as use of in-built cameras and animation apps has democratized mass communication and minimized India’s digital divide. At the same time, the smart technology and its main users have been turned into most effective tools for murderous mobilizations, in the name of Ram or Rahim in our part of the world. The lynch mobs of self-appointed cow-protectors which are now rampaging across the land, mostly comprised of young Hindu males, have already tested the heady cocktail of religious fanaticism and digital empowerment. Baduria-Basirhat has shown that it has found its connoisseurs among the Indian Bengali Muslim youth too, close on the heels of fundamentalist Jaamat and Hefajat followers in Bangladesh. Souvik Sarkar is a 17 year old student of class XI and resident of mixed population village of Magurkhali at ward number 17 in Rudrapur area under semi-rural Baduria municipality. His anti-Islam Facebook post or sharing of it detonated the communal unrest on or before 2 July, Sunday on the eve of Ulta Rath, a part of popular Hindu festival, Rath Yaatra. A mob of Muslim youth surrounded their home and tried to get hold of him in the same day evening before police nabbed him in the wee hours of Monday. A group of angry protesters tried to torch the abandoned pucca house of the boy’s family on Monday evening. But the neighbors, both Hindus and Muslims together doused the flame. The boy’s family has left the village and remained incommunicado, presumably under police protection since then. The suspicion about a larger sinister design behind the circulation of the sacrilegious post has gained ground following our interaction with village elders from both communities including the Imam of Magurkhali Milan Masjid. They gave a different impression about the accused boy and his role in the crime. According to them, the boy’s immediate family was not well-to-do and not in shape after he had lost his mother and his father, a mason, became disoriented. However, he stayed with his uncles, both lower rank policemen who built the pucca house few years back almost opposite the village mosque. An average student, he was not known either as a wayward child or aggressive adolescent. “I saw the boy but did not know his name. I knew his uncles are policemen. We had no regular interaction. But neither the family nor the boy had ever misbehaved with us. Both Hindus and Muslims are their immediate neighbors. I am not aware of any religious tension among them which might have affected the boy. The crime he said to have committed hurts me deeply. But I doubt whether the boy had the intelligence and expertise to do this,” Md. Yasin Mandal, the middle-aged Imam of the mosque for last 25 years and resident of neighboring Narayanpur village said. He suspected a deeper and larger design of rupturing the peace which had used the boy as a conduit of hate campaign. “He may have fallen prey to some bad elements,’’ the Imam wondered. Elderly Gautam Choudhury, the scion of former zamindar family of the village who stays down the road deep in the village and now runs a grocery store besides holding some farmland too sounded soft on the accused. “The boy was known as needy and good-natured. We heard that he had told his aunts and some friends about the picture which he had received in his mobile. His family told him to delete it but he could not do it before the trouble began. Hope police will ascertain the facts,” Choudhury said. Monoranjan Mondol, the retired headmaster of a local primary school and another neighbor recalled that both the boy and his father’s elder brother were among his pupils. “Sarkar family had never shown any hatred against Muslim neighbors. The boy was not bad in studies or every day demeanor. I don’t know what he was doing with mobile phone since I can hardly handle it. But the way he landed in the trouble made us distraught,” he said. Durgapada Sardar, a tribal elder of the village which has few tribal families shared the same sentiments about the village tradition and the ‘disrepute’ it suffered following the recent violence. All of the elders were worried about the ‘mobile menace’ and its impact on the ‘gullible youth’. Some locals from both communities who had a closer look at the profane post suggested that certain expertise in computer graphics was needed to do the thing which Souvik had apparently lacked. They pointed out that prototype or templates of such graphics and cartoons by anti-Islamic groups, both western and eastern, are available online. The pattern of boy’s sharing indicated that he had probably shared some other/s’ hate-post on his time-line with his friends group. Whatever may be his immediate motive; assigned bigotry or irresponsible fun out of adolescence immaturity as some villagers suggested, its consequence has opened chinks in Bengal’s social fabric, irrespective of his intent. The Imam said he came to know about the offending post from one participant of the young Muslim mob, mostly ‘outsiders’ who had come to nab the accused. Sunday being the day for weekly ‘Hat’, the traditional market, the news about the post was spread like wild fire. The age-old means of word of mouth notwithstanding, the outrage became instant and endemic as the mobile-toting youth shared the visual with hundreds of their facebook and whatsapp friends who rushed to the town from outlying villages to avenge the crime. In the meantime, the location and identity of the accused had become a common knowledge and presence of him in the locality swelled the mob that headed to Magurkhali. Who organized the group behind the scene or on-spot is to be ascertained by the police. “Hearing the commotion outside, I had come out of the mosque after Maghreb namaz (evening prayer). I found a large group of young Muslims, mostly outsiders. Elder uncle of the Hindu boy had rushed back home by that time. He sought pardon from the incited youth but failed to pacify the mob. The accused boy was present at home but managed to flee throw the backdoor bushes and hid himself in the fields of standing jute crops. Police arrived by now and ‘arrested’ the uncle but could not find the boy. The frustrated youth left the spot and blocked the road in front of Rudrapur high school. “I went to the spot at around 9-30 p.m. They not only demanded immediate arrest of the boy but also wanted police to turn him over to the mob for instant justice. Some demanded his public hanging. Many of them were busy in circulating the offensive thing from their mobiles and calling friends to join the protest,” the Imam said. As the temper kept rising and crowd grew larger, a few local Muslim religious leaders and madrasa/school teachers, egged on by the police and politicians of the ruling hue, tried to pacify the mob. Police officials addressed the mob assuring arrest of the offender within 24 hours. Souvik’s arrest in the wee hours of the next day, however, failed to calm down the agitators. Instead, series of blockades on roads and train lines in and around Baduria were organized on Monday and Tuesday. Not only that, local police station was attacked demanding public lynching or hanging of the accused boy, Mandal recalled. While condemning the ‘excesses’ committed by the Muslim youth, the Magurkhali Imam also gave us a valuable glimpse of their minds in the wake of their instant access to global and national information, rather disinformation campaigns or fake and exaggerated news mainly through social media including fundamentalist and terrorist propaganda. According to him, the youths cited atrocities on Muslims across the world and in India as they looked for an opportunity to vent their ire. “They named many places and incidents that I don’t know about. They asked me how long we should keep silence over such atrocities to Muslims. I told them we can’t undo all the wrongs happening elsewhere. But if we shatter peaceful coexistence of Hindus and Muslims in Bengal, it will harm us more. But they refused to listen,” he said revealing the impact of global and national narratives on local imperatives. Criminals took advantage of the youth fury. “Among the headstrong and trouble-prone (chyangra and Hujuge) boys, there were cattle-runners and other criminals who had been to jails or under bail. They had scores to settle with police and looked for the uniformed men to turn up at the blockade sites,’’ he said. Others Muslim leaders also pointed to the factor during our interactions.